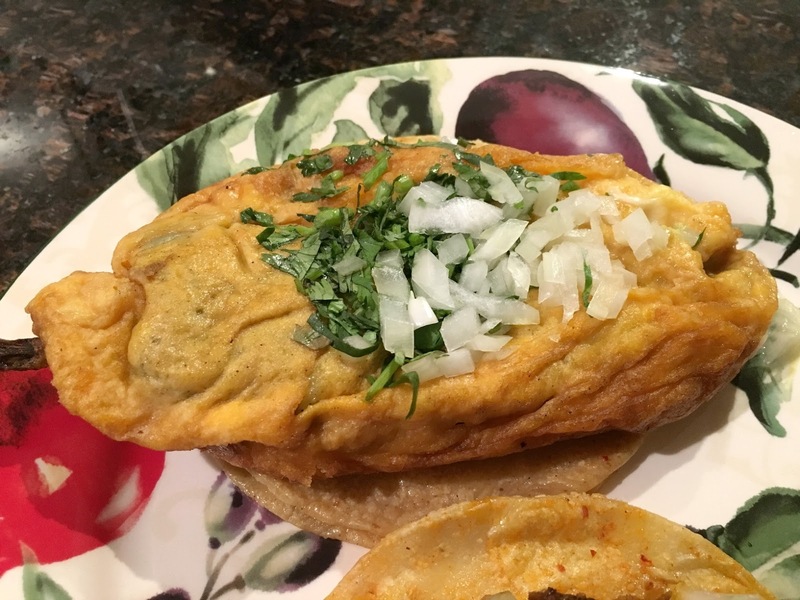 For many years the criterion on which I judged any Mexican restaurant was their chile rellenos and I would order them if they were on the menu. Most of them were decent but none really stood out. And then I saw the chile relleno taco at Taqueria San Juanito, the Mexican restaurant right around the corner from my new apartment. I couldn't imagine what it could be so of course I had to order it. I took it home along with the taco al pastor I ordered and opened it up to see what it could possibly be. And as you can see by the photo above, it is a full chili relleno sitting on two corn tortillas. I don't know what I was expecting - maybe some kind of deconstructed version - but there it was in all its glory. And it was delicious. I didn't really need the taco al pastor but it was tasty too so I ended up eating them both anyway. I didn't know this was a thing although a friend told me she has seen it on other menus around the city. If that is the case I am all for it. The breading was crisp and not too greasy and the tortillas, which are hand made, were thick and soft and delicious. If you ever see a chile relleno taco on the menu do yourself a favor and order it. You will not be disappointed.